To experience some of Australia’s best marine wildlife, you can’t beat a Montague Island Tour with Narooma Tours. First spotted by Captain James Cook in 1770, Montague Island has a rich history and our experienced guides are ready to share their knowledge on one of our guided Montague Island tours. Our Island tours include the opportunity to climb to the the top of the Island’s 21 metre lighthouse. Built in in 1881 the lighthouse boasts panoramic views of the Island and the beautiful New South Wales coastline. The afternoon tour leaves at either 12:30pm or 1pm lasts three hours and includes a 1.5 hour guided tour of the Island, featuring the lighthouse, a chance to see seals in their natural habitat and refreshments as well, you also have the option to snorkel with the seals. 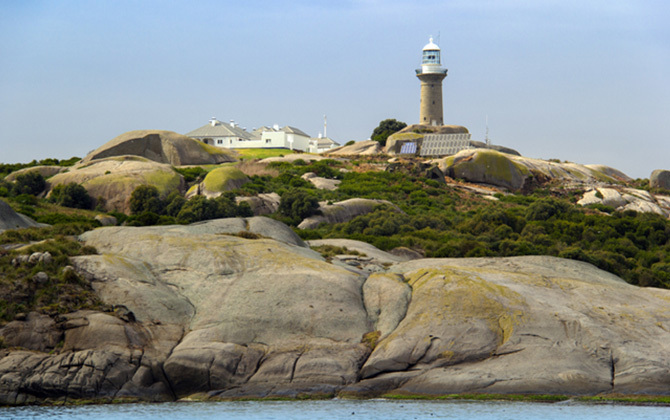 Our Montague Island and Snorkel tour includes a 1.5 hour guided tour of the Island including a chance to visit and climb the lighthouse, followed by a chance to explore the underwater world and frolic with playful seals in one of the Islands sheltered bays. Refreshments, snorkel, fins and masks are provided on this tour. Our afternoon Montague Island Tours, and Snorkelling tours can run together, so returning times may vary. We can offer you and your family/friends the options to just do the Montague Island Tour, or just Snorkel or to do both the Montague Island Tour and Snorkelling.